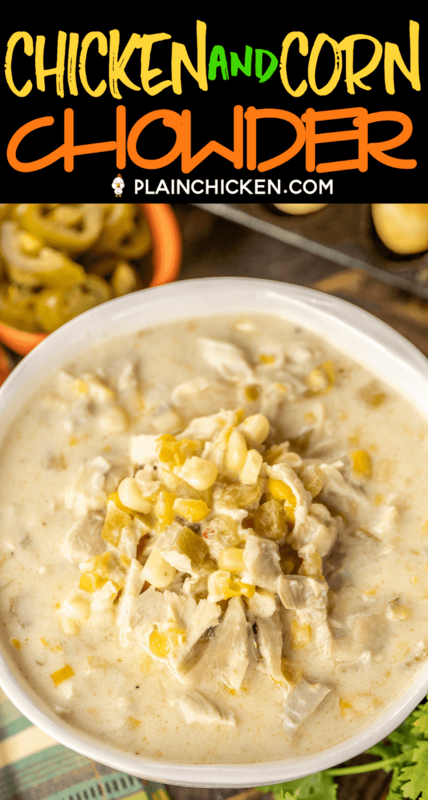 This Chicken & Corn Chowder is comfort food at its best! 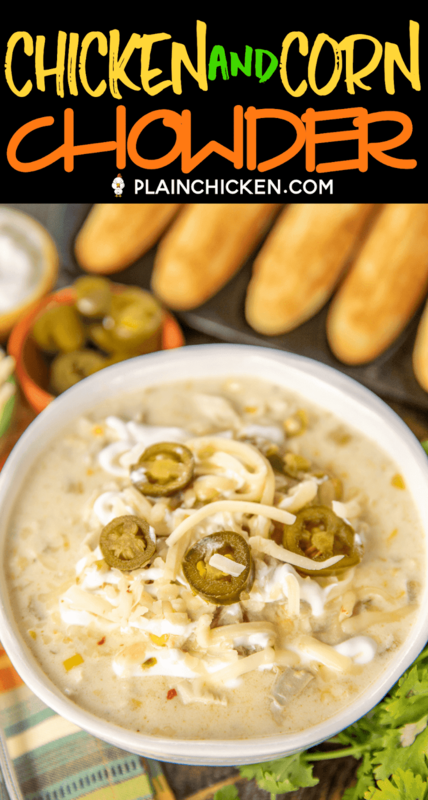 It is the perfect way to warm up in this chilly weather. 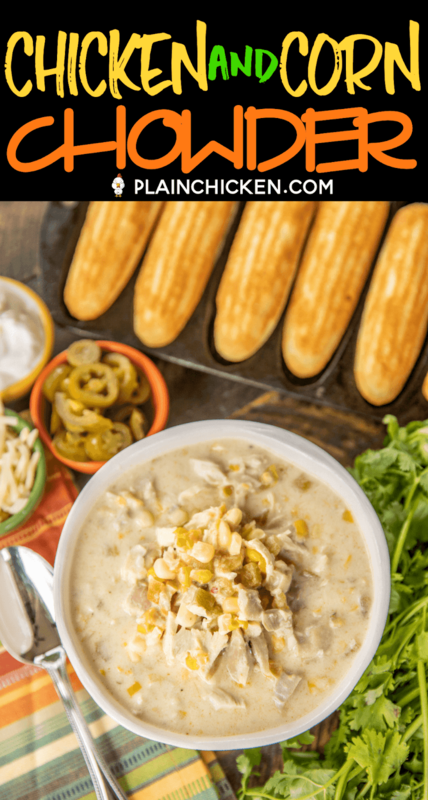 Creamy cheesy chicken and corn soup with a little kick. 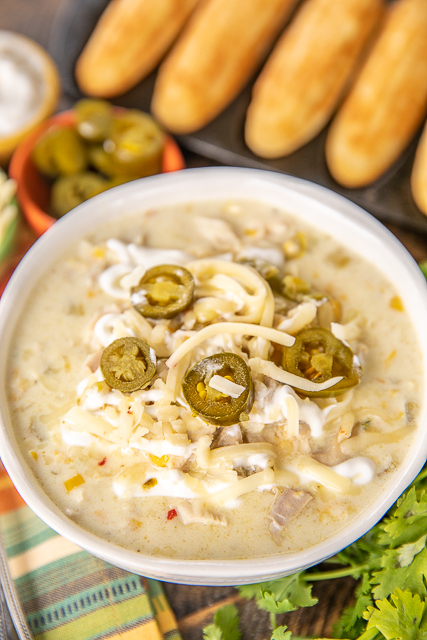 The best part about this soup is that it is ready in about 30 minutes! WOO HOO!! 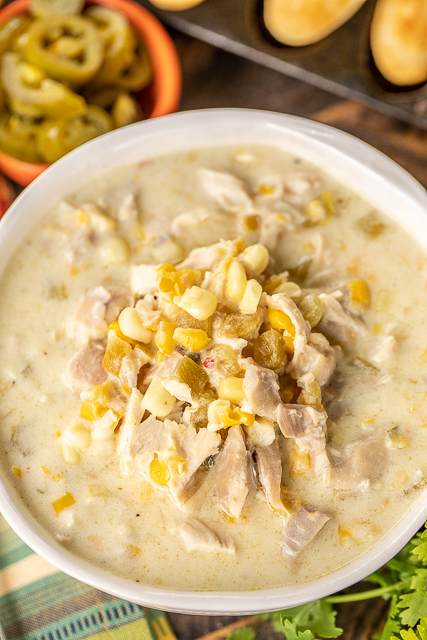 We ate this Chicken & Corn Chowder for lunch and dinner the same day. We still had a lot of leftover soup, so I boxed it up and shared it with a friend. She LOVED it. 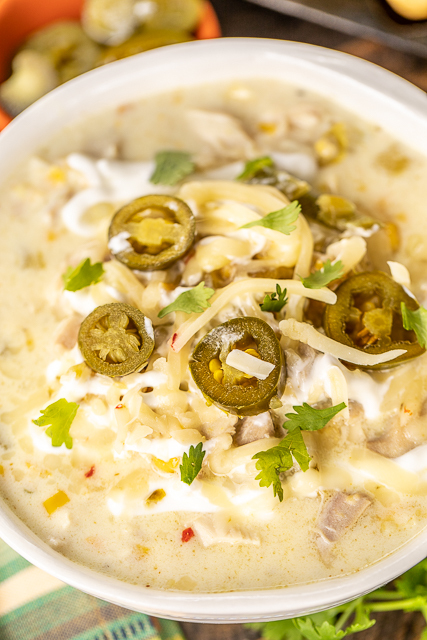 There is a can of chopped green chiles in this Chicken & Corn Chowder. It gives the soup a nice flavor and not any real heat. I also used shredded Pepper Jack Cheese in the soup. 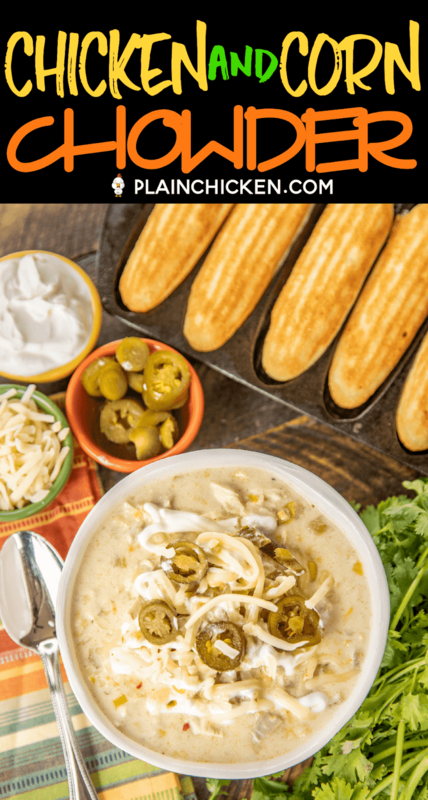 Feel free to swap that out for plain Monterey Jack cheese if you don't want the extra peppers. As I said, we all LOVED this soup. It is on the menu again for this weekend. 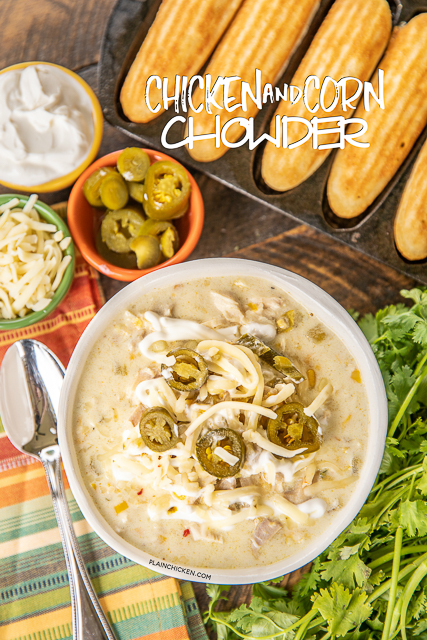 We topped the soup with some sour cream, jalapeños and more cheese. It would also be good with some Fritos. All you need is some cornbread and you are set!! Remove skin from chicken and discard. Remove meat from chicken and chop. Discard bones. 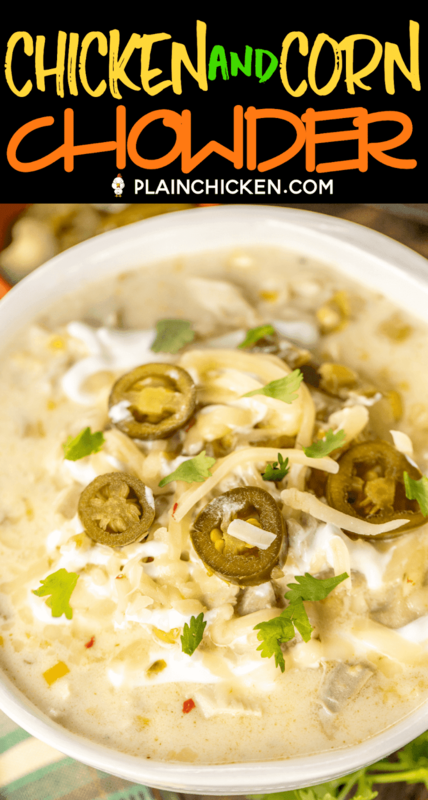 Place chopped chicken in a Dutch oven. Add remaining ingredients and stir. Bring to a boil over medium-high heat. Reduce heat and simmer for 20 minutes. I'm FREEEEEEZING here in Ohio - would love a big bowl of this right now!!! How much chicken? I have chicken breasts not rotisserie. Is there a way to make this reduced fat? Maybe try milk instead of the half-and-half. If it doesn't thicken up, add try adding some flour. what about using chicken broth/stock instead of water and chicken boullion? You can certainly do that. The chicken flavor won’t be as strong as the combination above is about twice as strong as regular broth.